In the wetlands of California’s Martinez Regional Shoreline on November 2nd of last year I came across the strange-looking (to me) plant shown here. I had no idea what it was, but when we were walking back to the car I noticed a woman coming toward us carrying a bunch of plastic buckets. On impulse I asked: “Are you a native plant person?” She said she wasn’t specifically, but it turned out she was indeed a biologist and knew a fair amount about the native species there. She identified my mystery plant as pickleweed. She added that its genus had changed and she couldn’t remember which of the two names that came into her mind is the current one. 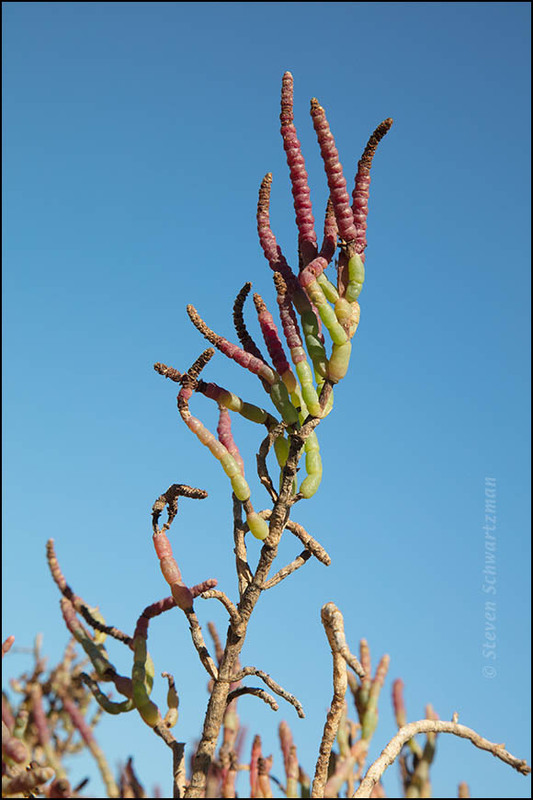 I looked it up later and found that the latest name is Sarcocornia pacifica (changed from Salicornia). 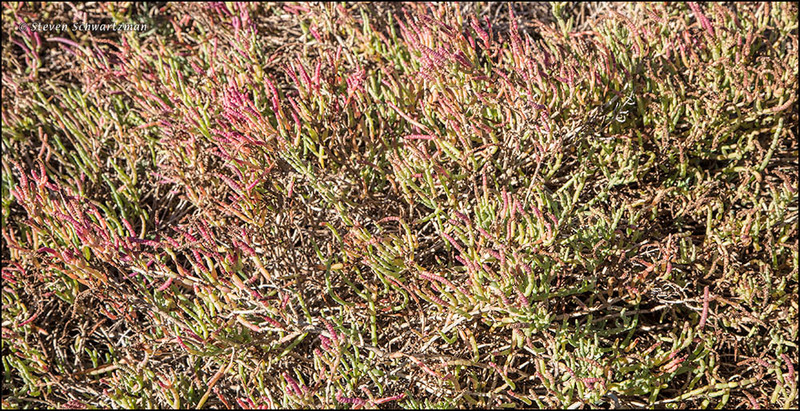 I also learned that other common names for the plant are sea asparagus; perennial saltwort; American glasswort; and Pacific samphire, along with a folk-etymologized version of that, Pacific swampfire. Also strange is the disjoint distribution of this plant, which includes Long Island, where I grew up on the other side of the country from California. Below is a closeup showing why this plant has traditionally been put in the goosefoot family (botanists now classify it as a member of the amaranth family). Click to enlarge a bunch.